I've already made two batches of these nuts. They are super delicious. They are sweet and salty with a hint of a kick. I bought the cashews at Costco. 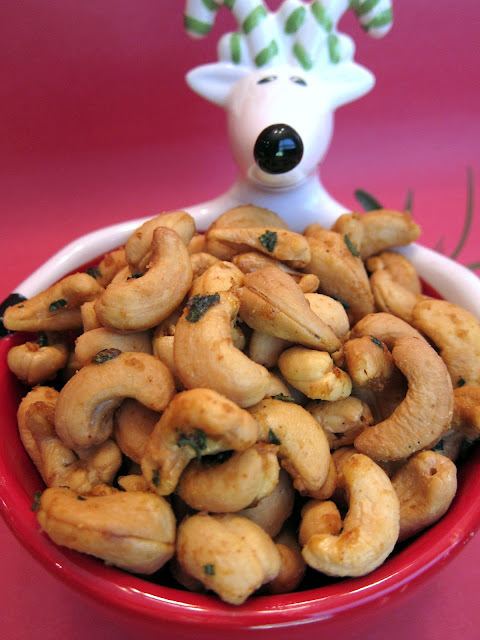 The container has enough cashews to make a double batch of this recipe. I highly recommend doubling the recipe. These nuts are so addictive. These are great to snack on during the holidays. I plan on making another batch to give away to my neighbors. Place the nuts on an ungreased baking sheet and bake for 10 minutes. Meanwhile, combine the rosemary, cayenne, brown sugar, and butter in a large bowl. Toss the warm nuts with the rosemary mixture until the nuts are completely coated. Yum - love cashews and these sound so good! If there is one thing that will get me to spoil my diet each and every time, it NUTS! LOVE,LOVE,LOVE them. I actually can't have them in the house simply because of the power they have over me. However, at Christmas, all that goes out the window. Bring on the cashews!!! I've been using this recipe for years and it's my go to Christmas gift. **tip the best cashew prices I've found are at Aldi. I did more butter and sugar in the mix....like a stick of butter and 1/4 cup brown sugar...and added some garlic powder and black pepper...it made almost a brittle crunch on the nuts. SO good. Would have never combined the rosemary, sugar, and nuts....thank you!